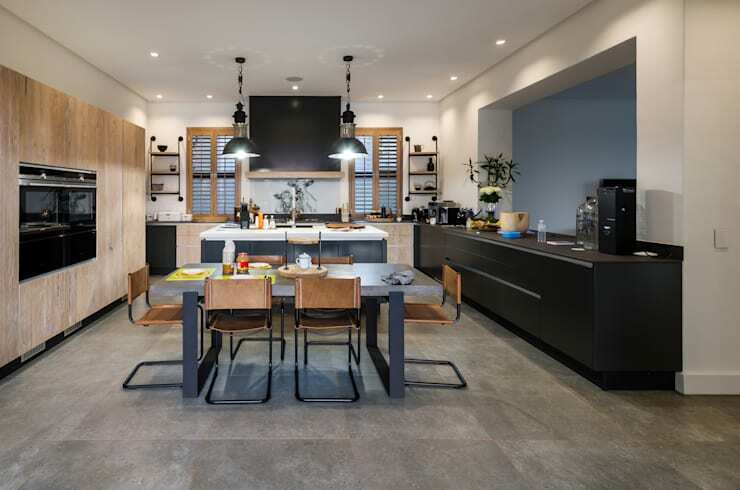 Our latest homify 360° discovery comes to us from Karel Keuler Architects in Weltevredenpark who were tasked with designing a farmhouse concept for a client who grew up in the Free State province and wished to recapture their childhood nostalgia growing up on a farm. 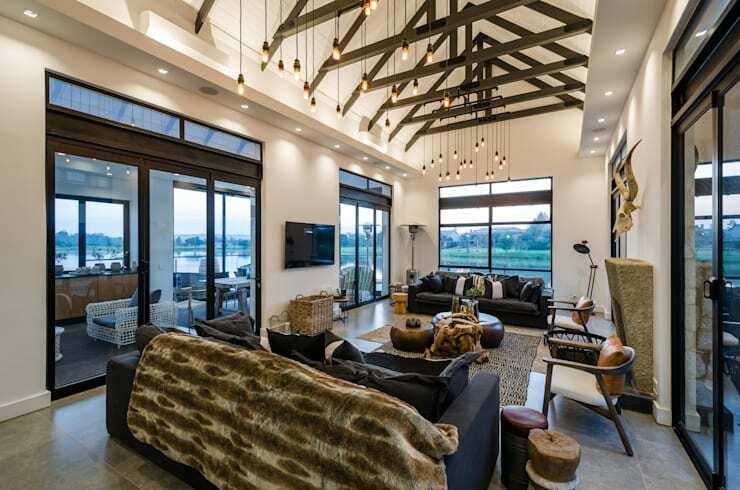 Of course everything has progressed since then and the experts in charge opted for a modern farmhouse design concept to embrace the farmhouse style, but simultaneously incorporate modern lifestyle into the house. 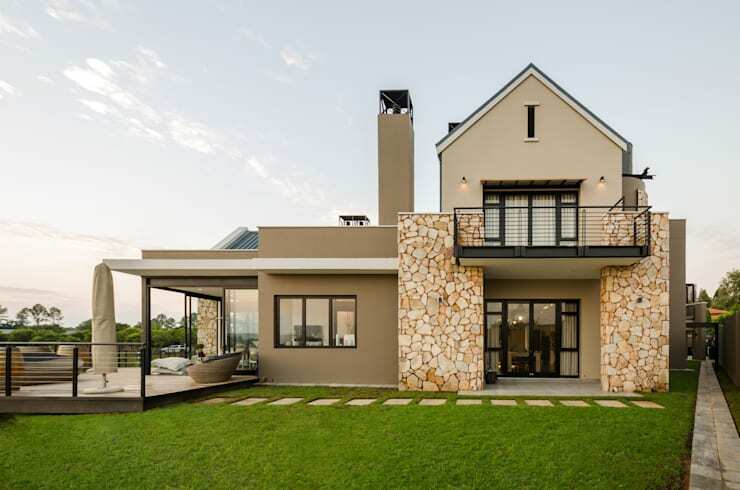 This one-of-a-kind property is situated in the nature reserve of the Silverlakes Golf Estate, complete with free-roaming small game in the area. 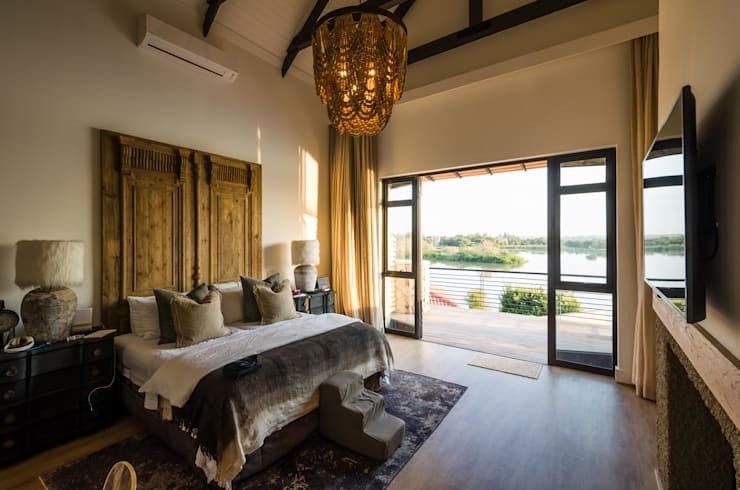 An additional major feature of the property is that it lies adjacent to the dam in the nature reserve, ensuring magnificent views for the residents. With these natural attributes of the property, the house was designed to embrace these aspects with a flow between nature and the structure. The overall design layout is a series of vernacular rectangular sheds linked together as per the old farmhouse concept, complete with pitched steel roofs, stone cladding and metal water tanks which are all in true farmhouse character. To this was added a vast amount of steel I-beams, channel sections and purpose laser-cut steel sections, as well as cantilevering and floating concrete elements. 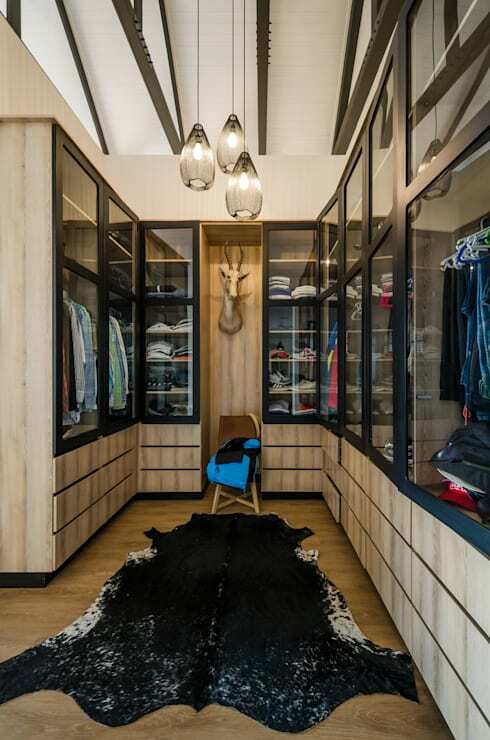 As far as first impressions go, we are definitely floored. 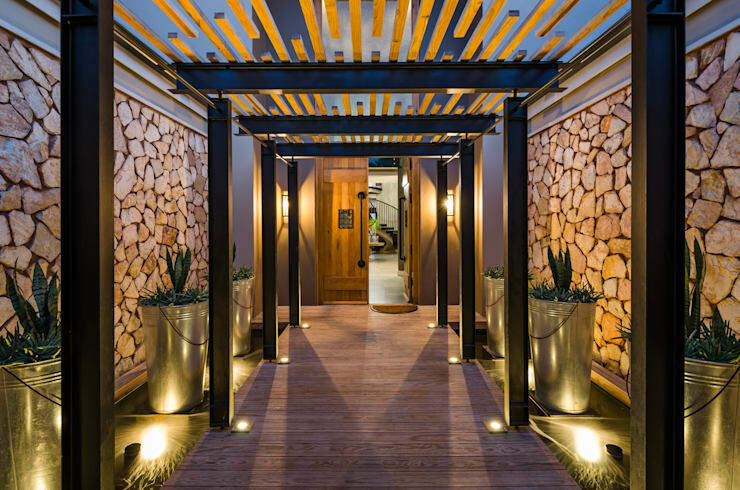 This wooden walkway that leads to the main entrance, and is brilliantly lit up along the sides, is enough to make any guest feel like royalty. It’s rude to stare. But in all honesty, who wouldn’t have their jaws on the floor? 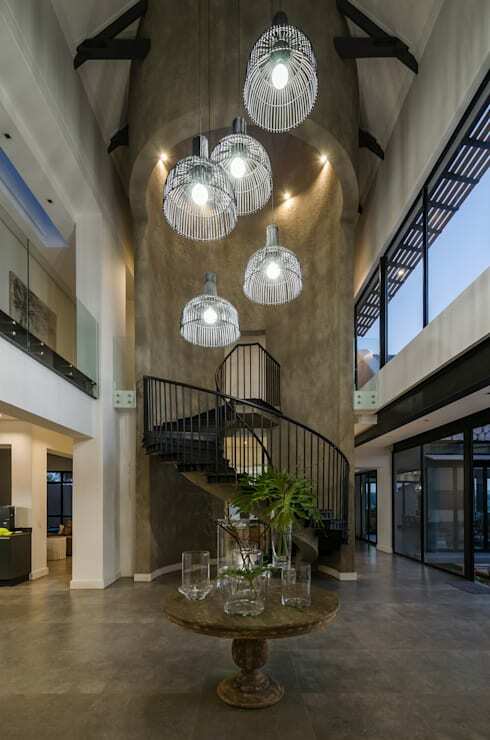 Two major design elements to be found in this house are the three-storey high concrete silo structures which are located on the main entrance axis of the house. The first silo acts as the entrance hall while the second silo encases the focal spiral staircase (pictured here) that leads to the first floor. Now this is certainly one dining room you don’t get to see very often, and we’re not just referring to the abundance of space. 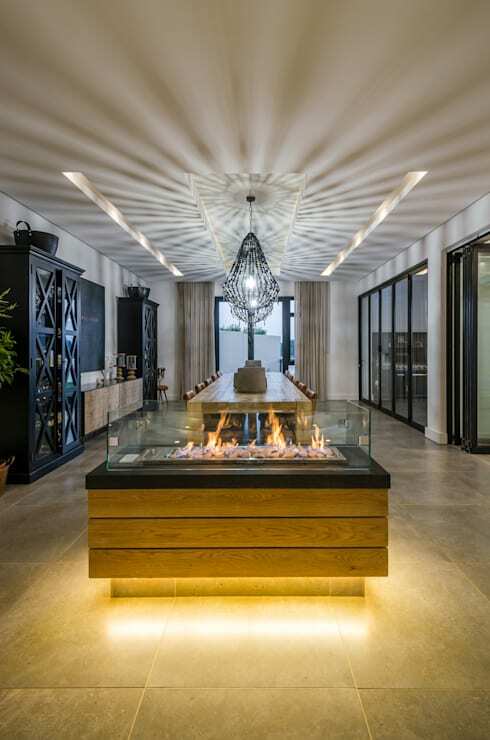 That ultra modern fireplace fixture is perfect in adding not only a focal point, but also a hot conversation topic (pun fully intended). And what magical shadow playing is caused by those extravagant chandeliers dangling above the elongated timber dining table! Obviously this house flaunts more than one bedroom, yet we’ve picked out this particular one for its prime dam views, as well as that other unique feature: the headboard, which is a most decadent throwback to yesteryear’s country/rural living to firmly enhance the farmhouse style of the house. Let’s sneak a peek at some more photos of this gorgeous structure. For some more rustic splendour, have a look at this Old Farmhouse Reborn as a Stylish Family Home.